This is another card Terri shared with us at our Demo Diva night this month. I love the added texture with the embossing folder and the cut outs. Great job, Terri! This is the beautiful Christmas Tree Terri shared with us at our Demo Diva night this month. We actually used six small trees and layered them to make the big tree. The trees and the trunk were all embossed, and then we just accessorized with a red bow. Great idea, Terri; thanks for sharing with us! THE PERFECT GIFT FOR YOU IS HERE! Treat yourself this holiday season! Take your love for papercrafting and SAVINGS to a new level! Enjoy 25% Off the $99 Starter Kit! The Start Kit is being discounted 25%--you pay only $74.25. Limited-Time Offer! The Starter Kit Sale runs from Nov. 24 thru Dec. 2. You Pick! Choose up to $125 in Stampin' Up! 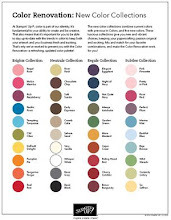 products for your kit. Starter Kit items can include Online Extravaganza Sale Items, 15% Off Bundles and Clearance Rack items. That’s over $50 in FREE product! Free Shipping! The kit ships FREE (another 10% savings). Extra Savings! Once you join, you receive a one-time 30% off discount on a product order of $150 or more placed within 45 days of when you become a demonstrator. Big Discounts! Enjoy a minimum of a 20% demonstrator discount every day. 5% Bonus Special! Receive 5% cash back on all personal purchases and outside sales in December. Cash back is in addition to your discounts and will be paid in January. Be first! December 5 marks your first chance (with your demonstrator status) to see and pre-order products from the NEW Occasions Catalog and earn Sale-A-Bration gifts (also new)! Nothing To Lose! You have through April 30, 2015 to try being a demonstrator and enjoy all the demonstrator discounts and benefits. No penalty! If you reach $300 in sales by the end of the first FULL quarter, you will renew and remain active for another quarter. If you don’t reach $300 in sales, you can “drop” with no penalty. No Strings! There is no obligation to hold workshops or parties, sell products to others or personally purchase anything beyond the kit. It is that simple to join Stampin' Up! and become part of a wonderful company. Join my Rubber Room Ramblings Stampin' Up! family, and you will receive additional benefits, including a $25 Stampin' Up! gift certificate (redeemable only through me). Don't forget to join before December 2nd to enjoy all these benefits! JOIN MY RUBBER ROOM RAMBLERS STAMPIN' UP! FAMILY HERE! Look what's on sale this week! Order by midnight, December 2nd to get these savings! That Stampin' Up! Holiday Shopping Extravaganza has begun! There are special bundles available today only, so be sure to check it out. There are lots of items 50% off. You can save serious money on punches, Blendabilities, Big Shot Accessories, Stamp Sets.... Treat yourself to some awesome Stampin' Up! products, or give these products as gifts. Either way, you will love the savings! View the downloadable and printable PDF HERE to see what's on sale. My dear friend, Brenda, saw the elf treat bag "That Michelle" made (I shared HERE), and since she loves punch art, decided to recreate it. Here is what "That Brenda" shared with me. I love her mouth! Here is a Curvy Keepsakes Box I made with clear plastic (acetate) sheets. This is my "before" picture. The plan is to stamp on the acetate with some white Staz-On and then put some kisses in with my hugs; change the ribbon to the 1/8" silver ribbon and add a tag saying "Hugs and Kisses". Not sure how it will look with the stamping, and may like it better just clear. You will be able to be the judge later this week. When I get the "after" done, I will post it here! A LITTLE CANDY "STACHE" FOR THE HOLIDAYS! 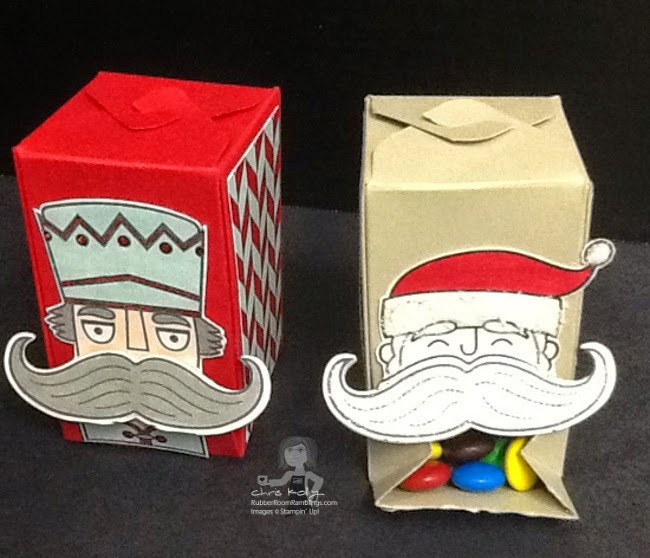 "That Michelle" and I made these cute little candy holders with the Gift Box Punch Board, the Santa Stache Stamp set and the Moustache Framelit. These little guys are adorable and look very festive on a holiday table. They also make a cute little gift. "That Michelle" put a little bag of M & Ms behind the box and slipped them both into a cello bag, tied with a ribbon and added a festive tag. Then she took them to a craft fair. What a great idea! ONLINE EXTRAVAGANZA STARTS MONDAY~~HIP HIP HOORAY! Stampin' Up! is having a humongous eighty-day sale (starting Monday, November 24th and ending Monday, December 2nd), with door buster savings on the first day and the last day. I will be presenting my hubby with my "SU! Wish List" because I know when he is saving, my stocking is getting fuller and fuller! Check out what's on sale, fill out your wish list and start saving, my friends. HERE IS WHAT'S ON SALE! CURVY KEEPSAKE BOX OLAF FROM FROZEN! "That Michelle" strikes again. This time she has made "Olaf" from the Frozen movie using the Curvy Keepsakes Box Thinlits Dies. It seems everything is better with this die! ORDER YOUR CURVY KEEPSAKES BOX THINLITS DIES HERE! MORE FROM "THAT MICHELLE" AND DIVA NIGHT! This is what "That Michelle" shared with us for Demo Diva night this month. He is just so stinkin' cute. 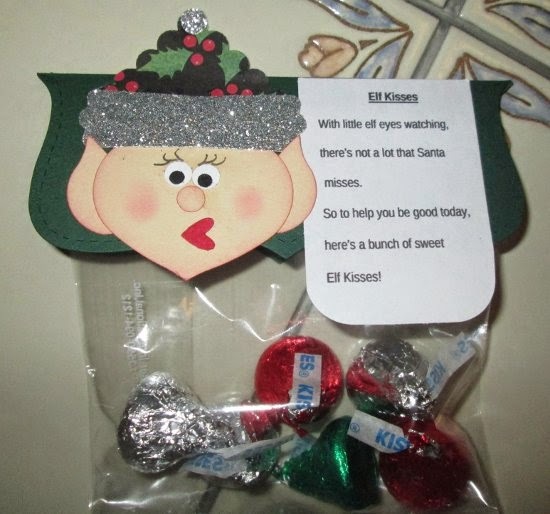 This is perfect for a class treat or to a stocking stuffer, or just to hand to someone who is having a very bad day. After all, it is filled with kisses, and who doesn't need a kiss every now and then to make them smile? There were lots of Stampin' Up! punches used to create the little elf face, but I love the bling from the Silver Shimmer Paper! Thanks for sharing your creativity with us, Michelle! The latest weekly deals are here! These would make great stocking stuffers, and at a discount, you may need more than one or two. 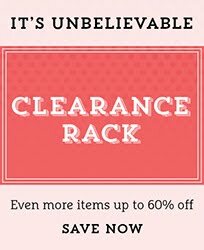 There are tons of awesome deals on the Clearance Rack, so be sure to check it out while you are shopping and increase your savings! AN UPCOMING TREAT YOU WILL BE THANKFUL FOR! Place an order of at least $150 in December and get 30% off plus a cash bonus of 5% (this order can be for yourself or with your friends and family) AND you earn Hostess Benefits! I am so very thankful each and every day for the flexibility I have being a Stampin' Up! Demonstrator and for all the wonderful friends I have made (both customers and fellow demonstrators). 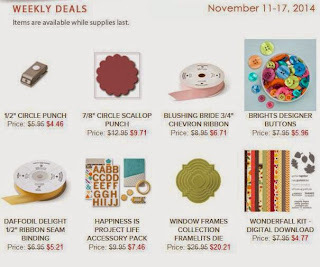 If you are interested in enjoying the freedom of running your own business, saving money on your paper crafting supplies, and having tons of fun every time you go to "work", you won't want to miss out on this special. Be sure to mark your calendar for November 24th! 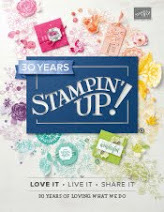 If you have any questions about being a Stampin' Up! Demonstrator and/or becoming a Rubber Room Rambler, please feel free to contact me. If you are a regular Rubber Room Ramblings blog reader, you know I have been blessed with an awesome group of SU! demonstrators that I love! Our Demo Diva night is always one of my favorite nights in the Rubber Room. This is the card Linda shared with us at our Diva Night this past week. This is the inside of Linda's card. Linda used the Making Spirits Bright stamp set from the Holiday Catalog. Our standing joke with Linda is that she always (and I do mean ALWAYS) has to find a stamp in her collection that I do not have, and she tempts me so much that I have to purchase it. And, she has lived up to her reputation once again! It is hard to see from the photo, but on the front of the card, we made little score lines that come together where the rhinestones for the holly are. The image is attached with dimensionals to the inside of the card, and then it shows through the punched square on the front of the card. Thank you, Linda, for sharing your creative talents with us, and for, once again, feeding into my stamping addiction. 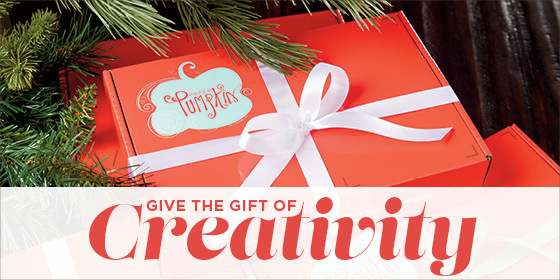 Paper Pumpkin Prepaid Subscriptions are the perfect gift this holiday season. You can share this gift with friends, family, and/or yourself! A fully designed project kit will arrive each month with stamps, ink, and paper so anyone can skip to the fun. It’s the gift that keeps on giving! Place your order at www.mypaperpumpkin.com Then you, or the person you choose the gift for, will receive an e-mail with instructions on how to redeem the prepaid subscription. Go to www.mypaperpumpkin.com and enter the redemption code. You, or the person you choose the gift for, will start enjoying your monthly Paper Pumpkin project kit the very next month! It is that easy to give the gift of creativity, and you don't even have to leave the comfort of your own home to purchase it, or worry about wrapping, or shipping. This is as easy as your holiday shopping can get. Congratulations!! You have an awesome blog. I feel so blessed to reach so many people with my blog, and I hope you will come back often to visit!! My blog is almost at 120,000 visits~~I am blown away!! When I originally started this blog, I had not idea how many people would stop by to see what was going on in the Rubber Room and my corner of the Stampin' Up! world. I am so honored you visit. Whether it is your first time visiting here, or you subscribe and don't miss a post, I thank you so very much, and hope you continue to visit! WONDEROUS WREATH FLIP CARD FROM DIVA NIGHT! I love my Demo Diva Night, and I wish we could get together more than once a month. This group of ladies are such dear friends and so very, very talented. I always learn a new technique or trick, and it is such a great opportunity for lots of laughter. My husband would swear we were all drinking from the sounds of glee and happiness escaping the Rubber Room. I will be sharing thelovely projects we made with you all week long, so be sure to stop back by. Last night I shared a project I was very excited about. It was a flip card made with the Wonderous Wreath Stamp Set and matching Framelits Dies. I saw this card on Pinterest and watched a quick video, and now I am hooked. I cannot wait to use this technique for a card with my star framelits dies and the hearts for Valentine's day and weddings. I have lots of uses for this technique! and this is opened up. It was very easy to do. You cut your card stock at 5 1/2" by 8 1/2" and score on the 8 1/2" side at 2 1/8" and 4 1/4". Then you put your wreath framelits onto the card stock with the 2 1/8" score line in the middle of the wreath. Set your Big Shot up with a magnetic plate, an acrylic plate, your card stock with the framelits on it, and then place your top acrylic plate so it is sitting on your 2 1/8" score line. This will make it so the top half of your wreath framelit does not have an acrylic plate on top of it, and it won't get cut out. Then run the sandwich through your Big Shot. Then take off your outside wreath framelit (the largest one) and leave your smaller wreath framelit in place. Put your top acrylic plate on top of the wreath framelit (covering the entire wreath) and put it through your Big Shot. This will cut out the inside of the wreath. I used my Stamp-a-Majig to line the words up in the center of the wreath. I hope you will give this technique a try. ORDER YOUR WONDROUS WREATH BUNDLE HERE! Buttons, ribbons, punches and framelits, OH MY! 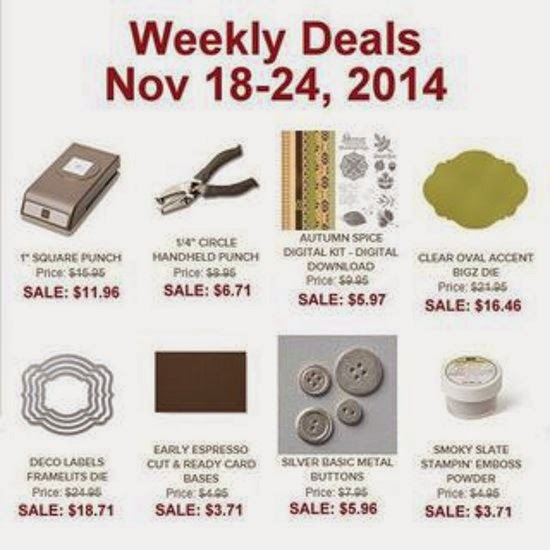 These things and more are on sale this week at Stampin' Up! They have added a Project Life Accessory Pack AND a Digital Download too! I admit I have been thinking about my holiday shopping list already, and some of these great sale items are a must-have purchase for those crafters on my list. If you want to save some money and get some of your holiday shopping done early and in the comfort of your own home, the time to order is now. In fact, some of these items are great stocking stuffer goodies~~even if it is for your own stocking! ORDER YOUR WEEKLY SALE ITEMS HERE! BANNER BLESSINGS, NEWEST PHOTOPOLYMER STAMP SET FROM STAMPIN' UP! I have totally fallen in love with the Photopolymer Stamp Sets by Stampin' Up! They are terrific quality stamps and completely clear. Being complete clear is so important, because it allows me to strategically place my stamped images EXACTLY where I want them. The latest photopolymer offering is going to be a well-used favorite of mine in no time at all. Here are a few samples using this stamp set. This card features the Four Feathers Stamp Set and Feathers Framelits Dies, which can be bundled (purchased together) at a 15% discount. These items are available in the Holiday Catalog. This is a Chevron Tag A Bag Gift Bag (10 packs are only $3.95), and it has been accessorized with some Designer Series Paper, a miniature Clothespin (24 for only $3.95) and some of the Natural and Old Olive Two-Tone Trim from the Holiday Catalog. This is one of my favorite samples! I love the "bling"added with the Gold Foil Sheets, the Fancy Foil Designer Vellum, the 1/8" Gold Ribbon (I love how she curled it) and the Gold Sequin Trim. When you combine all that gold with the gorgeous Blackberry Bliss Stampin' Up! new In Color, this becomes a very elegant card that is breathtaking! Want to learn more about Photopolymer Stamps? CHECK IT OUT HERE! Want to see more samples and learn more about how this Photopolymer Stamp Set was created? CHECK IT OUT HERE! Want your own Banner Blessings Photopolymer Stamp Set? ORDER IT HERE! Wednesday, November 12th is the last day to RSVP for November Wacky Wednesday, which happens November 19th. This month for Wacky Wednesday we will be making a box using the Gift Box Punch Board and two cards. Cost to attend Wacky Wednesday is $15, or FREE with a $25 minimum order. Wednesday, November 12th is also the last day to RSVP for the November Holiday Stamp-A-Stack, which is being held on Thursday, November 20th. The Holiday SAS is being offered from 10 a.m. to noon and again from 7 - 9 p.m. Cost of the SAS is $20 and you will be making 8 cards (2 each of four different designs). For both Rubber Room events you will need to bring your own adhesive. I will supply all the materials you need for your projects (including envelopes), as well as coffee, water and a light snack. GOODIES FROM THE RELAX AND CREATE RETREAT! In addition to a goody bag (decorated with an owl), everyone who participated in the Relax and Create Retreat received some "thank you" goodies (with an owl theme). This is a small water bottle everyone got in their goody bag. This helped to keep them hydrated during their crafting extravaganza! Everyone received this lovely cello bag treat full of chocolate and Smarties. After all, our day was filled with sweet treats and ladies smart enough to enjoy all the fun! This is a little package of TicTac mints we handed out after lunch, so everyone would be "minty" fresh as they faced the afternoon crafting challenges. The Owl punch was used to make the TicTac treats and to decorate the water bottle. The Top Note Die and several circle punches and one heart punch were used to make the owl face on the cello treat bag. We had a great time at the retreat relaxing and creating with lots of wonderful women! Stop back by tomorrow to see the rest of the projects we made. MINI SCRAPBOOK FROM RELAX AND CREATE RETREAT!